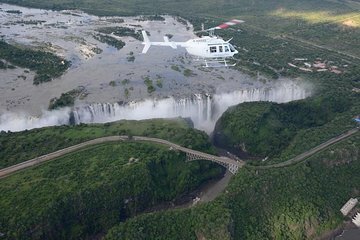 A Victoria Falls helicopter tour offers a stunning perspective and unbeatable views of this UNESCO-listed natural wonder. Choose between a 12- to 13-minute flight over the the falls and the Zambezi River or opt for a 25-minute flight that also includes the Batoka Gorge. A helicopter with wide viewing windows lets everyone on your tour get the same amazing views either way.